Our scientists have a cumulative experience of over 30 years supporting all aspects of drug discovery and development. Expertise and experience spans a broad range of target families including kinases, nuclear receptors, GPCRs, proteases, peptide binding domains. Our scientists have supported over two dozen customer programs and successes have included identification of leads using virtual screening methods, enrichment of hit rates in high-throughput screens, optimization of lead compounds to picomolar activities, and enhancing single- and dual-target specificities. Some of these projects have resulted in patents and compounds entering clinical development. BioPredict maintains a strong focus on methods development (see "Technologies"). A constant thread is the use of probabilistic methods utilizing all prior information to in selecting compounds to purchase, screen, or synthesize. Previous development has included novel Learning Methods software for the prediction of small-molecule bio-activities, Bayesian statistical methods for interpretation of results of high-throughput screens, decision-tree methods for characterizing and augmenting high-throughput screening libraries, surface-based phylogenetic tree generation of active sites in protein families to help achieve drug specificity to and within protein families, and a data-mining approach to augment energetic considerations in interpreting results of virtual screens. 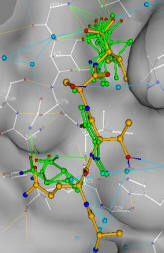 A current and representative internal research topic discussed further in "Technologies" is the use of probability distribution methods to formulate new, mathematically rigorous approaches to the problems of docking, structure-based 3D peptide profiling, pharmacophore search, and flexible small-molecule alignments. The method yield ensembles of solutions rather than individual solutions, helping to circumvent imprecision that plagues current approaches. Biopredict is also actively pursuing the GHKL superfamily of proteins to accelerate early stage discovery against targets within this superfamily. The superfamily includes diverse drug targets with application to oncology (HSP90) and to infectious disease (Gyrase B and Histidine Kinases). See Internal Discovery.